In a striking presence of daredevilry, a team of Army Service Corps (ASC) creates the Guinness record. These 58 Indian army corps rode a 500 cc Royal Enfield motorbike for 1,200m at the Yelahanka Air Force Station, Karnataka. Generally known as Tornadoes, these army men entered the Guinness Book of World Records at the Indian Air Force base in Bengaluru. Major Bunny Sharma led the group of 58 personnel and the bike was steered by Subedar Rampal Yadav. They were dressed in tricolor on the vanguard. The other people were standing on the flanks of the two wheels. Apparently, the ASC team hold 19 world and national records and have showcased their masterclass stunts at over 1,000 shows across the world. 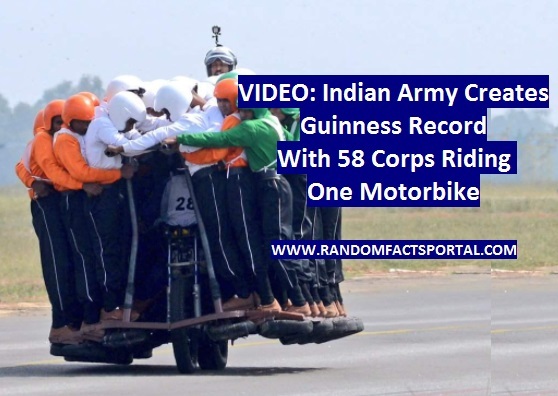 Additional Directorate General of Public Information tweeted the record-breaking video saying, “Motorcycle team of #ArmyServiceCorps, #TORNADOES, broke another World Record on November 19, 2017, wherein 58 men rode on a single moving motorcycle.The act was performed for the Guinness Book of World Records, Limca Book of Records and Unique World Records at Yelahanka #Bengaluru”.